In the city-state of Gujaareh, peace is the only law. Along its ancient stone streets, where time is marked by the river’s floods, there is no crime or violence. Within the city’s colored shadows, priests of the dream-goddess harvest the wild power of the sleeping mind as magic, using it to heal, soothe... and kill. N.K.Jemisin is the real deal, not only a good storyteller but also a sharp writer. 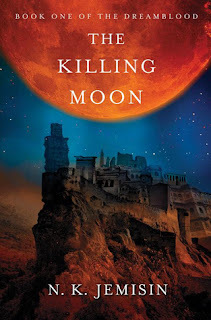 I am woefully behind in completing The Inheritance Trilogy but that won't stop me from grabbing The Killing Moon when it is released. She is one of the best new writers to come around in years and her writing is rich, filled with lots of layers, fresh and thoroughly entertaining. Plus, she's a fellow New Yorker, so how can I not support her? She's friggin fantastic. Oooh, awesome! I just finished The Hundred Thousand Kingdoms and absolutely loved it. I still need to read the other books in the series, but I will definitely be reading this one, too. Jemisin is a great writer. So excited that she has a new book coming out. Great pick! Thanks for stopping by. Ohhh new to me! But sounds interesting. Conspiracies and a reaper! Very curious. Not something I normally read but, it sounds interesting. I might add it to my TBR pile. Her books are on my list, but I never read them.. I think I should! I still need to read the Inheritance Trilogy as well, but this sounds like another great series. I still need to complete The Inheritance Trilogy but that won't stop me from starting this new series. Jemisin is a terrific writer and a great storyteller. Haven't heard of this one before will have to check it out further. Great pick, that sounds like a really unique book!